Global banking analyst and periodical International Banker has chosen BNF Bank for the award of Best Innovation in Retail Banking Malta 2018. The prize is one of a number of awards established to recognise top-ranking organisations that are doing exceptionally well, and which set new benchmarks for performance within the financial industry. “We adopt a laser-focused approach to providing recognition where it is due,” said a representative from International Banker. “A good bank is defined by its differences. It will not be exactly the same as the other because it will be shaped by the needs and demands of its own unique customers. 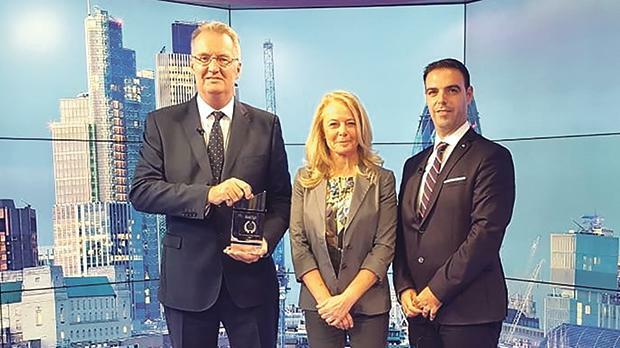 BNF Bank chief executive officer Michael Collis, accompanied by head of business development Melvin Pellicano, was in London for the prize giving ceremony at the London Stock Exchange. “The award presented to our bank reflects the importance we have always given to four solid operational value-added elements – a focused banking model, a personalised customer service, a visible and trustworthy brand that has gone from strength to strength as BNF Bank, and the enthusiasm and perseverance of our team in a highly competitive market,” he said. BNF Bank is one of Malta’s five core systemic banks. With a 200-plus strong team, a network of branches and ATMs across Malta, the bank offers a wide range of personal and business products, catering for the changing needs of a market in rapid transformation.